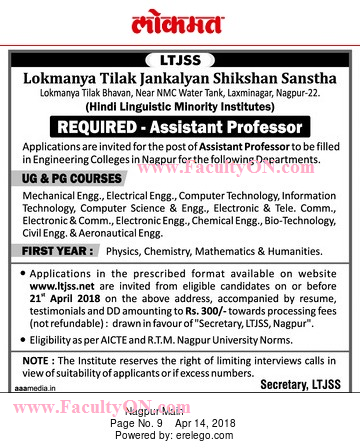 Lokmanya Tilak Jankalyan Shikshan Sanstha, Nagpur has advertised in the LOKMAT newspaper for recruitment of Assistant Professor jobs vacancies. Interested and eligible job aspirants are requested to apply on or before 21st April 2018. Check out further more details below. About College: Lokmanya Tilak Jankalyan Shikshan Sanstha (LTJSS) was founded in 1983 by the creative and dynamic visionaries Hon'ble Shri Satish Chaturvedi and Smt. Abha Chaturvedi. Shri Satish Chaturvedi with his determination and the support of his spouse, Smt. Abha Chaturvedi developed the Sanstha from a humble stage to the profuse spectrum that it exhibits today. Application Fee: Rs.300 as DD in favour of "Secretary, LRJSS, Nagpur"
How to Apply: Interested and eligible candidates are requested to send filled-in form (application can be downloaded from college website) along with copies of certificates, application fee DD and recent PP size photo to the postal address provided below.